Halibut, lingcod and rockfish rely on their sense of smell to find food. Bait usually provides enough scent to catch them. Meanwhile, adding scent to the bait boosts action. Bottom fishing in Alaska I combined these concepts to create a homemade scent bomb which attracted all these species while we were anchored. 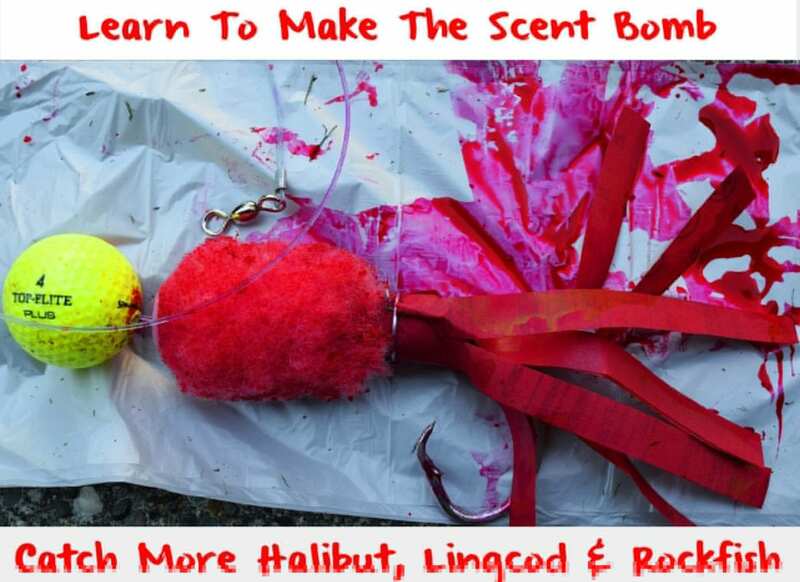 The premise is simple; make something that looks like an octopus (a favorite of halibut and lingcod) and provide a mass amount of scent to bring the fish to the bait. We started out with a 6-inch mini paint roller and cut it in half. The thicker the nap (the fabric portion of the roller) the better. This is the vehicle to retain the scent. Take a sheet of emery cloth (or extra fine sandpaper in a pinch, but that’s not as durable) and cut strips about ½ inch wide leaving about 1-inch at the top. Cut enough strips to wrap around the bottom of the roller and secure tightly with wire. The strips should be from 4 -6 inches long. It’s ok to remove a few strips to create some space between them, like you would a hootchie. Take an 18/0 circle hook and crimp a two-foot section of 250-pound mono leader to the hook. String the leader through the roller. As an option, you may also thread the leader through a golf ball for added attraction – both sight and vibration. Chartreuse and pink work great for color, whereas glow in the dark is ideal in deep water. Finish off by crimping an extra heavy duty swivel to the other end of the leader. Placing them in a Ziploc (or sealable container) soak the rollers in Halibut & Rockfish Nectar. The roller absorbs the scent and continues to release scent even if you attach herring (purple or black label) or the bait is stolen. Incase bait is stolen the scent bomb allows you to continue fishing. Step 7: Bait Needs Nectar, Too! 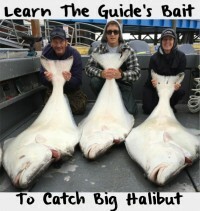 I’m a firm believer in scent and add Halibut Nectar to the bait, too. Using the nozzle at the tip of the Nectar bottle push hard to insert it directly into the bait and squeeze some scent in the body of the bait itself. Nectar is watery, which is great for the first application. Meanwhile, as firm of a believer as I am in scent, I want to use Nectar on everything and also prefer a thicker gel like scent. To achieve this I turn to masa, a flour like ingredient used in making chili. Combining masa and Halibut Nectar creates a thicker concentration, one gel-like enough to be smeared on the roller, bait and the tentacles. Now I’m ready to fish! While on anchor, add the appropriate amount of lead for the situation and bomb’s away. Once you hit bottom, set the rod in a rod holder, engage the reel and turn three cranks with the handle. Now, the scent is busy attracting fish down current so it’s a waiting game. Because we’re using circle hooks we don’t want to “yank” when a fish approaches and starts munching. Instead, wait until the rod is bent over continuously indicating the fish has hooked itself. Then a quick 5-10 cranks while in the rod holder and it will be safe to lift the rod out. Many times your rod will start bouncing, then nothing. But, remember the scent bomb is still working so leave it be. When it comes back, let it hook itself and be prepared for battle. I like to leave spare Pautzke scent bombs soaking while we’re fishing. This way, each time you reel up you can change out to fresh bomb (remember we used huge swivels at the top end of our leaders). Editor’s Note: Award winning author Terry Wiest is based in the Pacific Northwest, but makes the annual pilgrimage to Alaska annually. He’s the mastermind of Steelhead University. For more information please visit http://steelheadu.com.